The next few months will see Adidas release a new range of shoes. 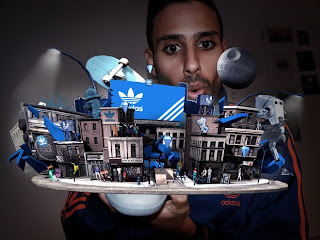 What sets this range apart is that Adidas has created a virtual 3-D world that is accessed through the line of five men’s shoes. On top of this, Adidas will also introduce three Augmented Reality games as part of the new virtual world. Each pair of shoes will give the owner access to the virtual world and act as the controller for interacting with it. All you have to do is go to the Adidas website and hold up a code embedded on the shoes tongue to your webcam. The virtual world then pops up on your screen as part of the shoe. The campaign will offer a skateboard game, played around the virtual city’s alleys, a Star Wars-like game and a music-based game. The games have been developed for Adidas by xForm.